● Shop in the Clearance section to save as much as 75% off select items. ● Visit the Discount and News sections to find the latest deals, which have included discounts on orders over $500 or free items with select purchases. ● Sign up for the email newsletter to find other exclusive promo codes, which have included deals such as $10 off select items or 5% off your order. ● The company offers a flat rate shipping fee of $5.95 for orders over 25 lbs. that are shipped within the continental United States. To learn more, check out the Shipping Options section of the Ordering Policies page. 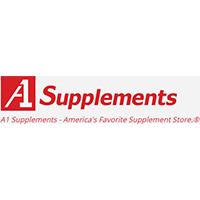 A1Supplements is a supplement site that offers vitamins, powders and other supplements for specific activities like weight loss or weight gain or to bulk up. There is a sales banner on the top of the homepage that offers the current sales and values that visitors can click on to link to the products. Shoppers can use the links at the top of the homepage to link to products for a full range of needs. This site also offer herbs which can be accessed by clicking on the corresponding tab. There are informational articles and videos also posted on the homepage. For most up to date offers check out A1supplements on Facebook and Twitter or contact A1supplements Support for any questions.